We had a great time in Asanvari Bay, Maewo. We arrived there on Monday, August 24, and had a fun time catching up with 3 very special boats – all people we like very much and have known for some time now. They all had to leave on Tuesday morning, but there were a dozen other boats in the anchorage that were part of the Island Cruising Association Rally of New Zealand. We got to know a lot of them over the next few days, and were included in all of the ICA rally events. There were a lot of really nice people there – a good mix of boats from the U.S., Australia and New Zealand for the most part. We know the leader of the ICA from last year, and he (John) and his wife Lynn are extremely friendly and outgoing people. They arranged for a lot of “events” between the yachties and the locals. Normally we enjoy doing this ourselves, but it was a nice change to be part of a group. The village of Asanvari is well known among yachties because of its extroverted chief, Chief Nelson, and his very charmismatic son, Nixon. The whole village was in mourning, however, because of a terrible tragedy that had just occurred two weeks before we arrived – the death of one of Chief Nelson’s sons. It was apparently the third of his sons to have died. They say it is all due to “black magic”. It was so sad, and somewhat awkward, to be there as a tourist at such a time. Somehow, however, the village still wanted to continue with many of the planned festivities between the yachts and themselves. I think they count on this annual visit for a fair portion of their income and perhaps they could not afford to forgo it. It sounds a bit corny, but the ICA arranged with Chief Nelson to have a little ceremony on Wednesday where each boat was officially adopted by a village family. 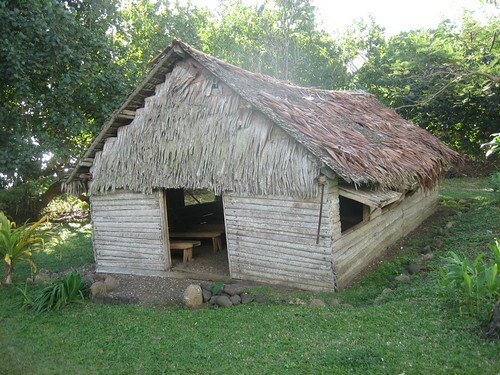 The families came dressed in their best outfits and presented us all with gifts of fruit and weavings, and even dresses for some of the women – a consistenly unflattering dress called the “mother hubbard” that was introduced to the islands by the missionaries a hundred and fifty years ago. The yachties all brought gifts to their adopted families over the next few days and got to know each other. 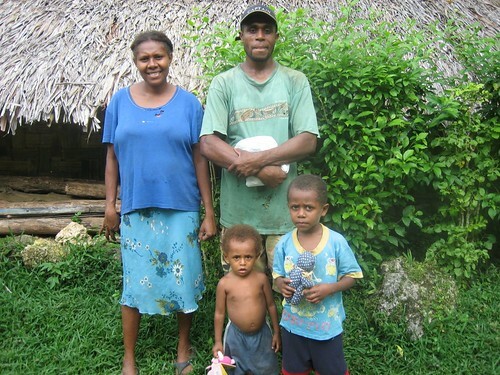 Our “family” consisted of a husband and wife (Maurice and Katherine) and their children – we were never sure exactly how many children they had, but we did get to know their 12 year old girl Meery, and their 25 year old son, Paul a bit. Meery and her friend Violet accompanied us on a hike up to the top of the hill overlooking their village, and over the top of the beautiful waterfall that flows down to the sea. Meery and Violet were barefoot while Mark and I trudged along, slipping on the rocks, even in our hiking boots. We sang songs to each other and had a wonderful time. The next day there was supposed to be a dance put on by the locals – a kustom dance – with traditional costumes and very primitive instruments. 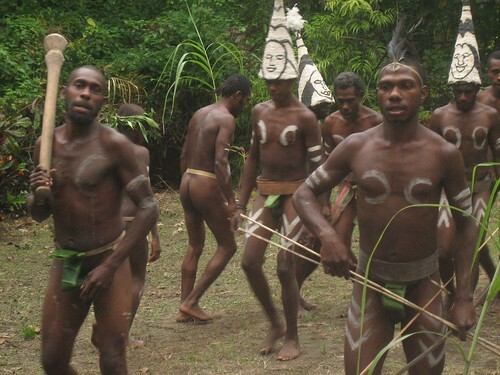 The young men who usually dance were mourning the death of their friend and did not dance. Only 2 adults and 3 young boys danced – and only for a few minutes. Then they made us a feast – consisting primarily of a very large, and very well cooked pig that they had killed that day. 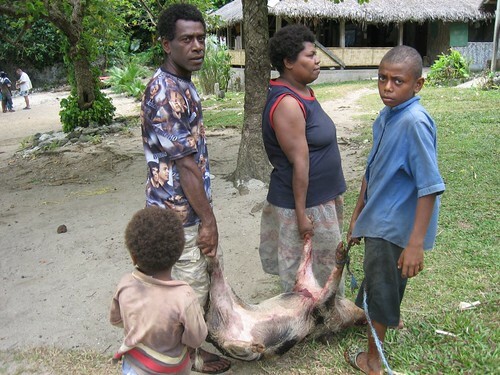 The pig was roasted in the ground for the entire day. Mark and I had actually heard the poor guy squealing his head off just before they disposed of him earlier in the day. 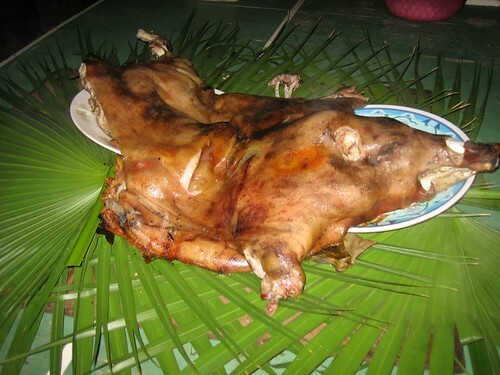 I am not too keen on pig – particularly large boars with their heads intact – so I just filled up mainly on rice and some vegetables that were also served. Everyone else was pretty happy about the pig meal. The village arranged for a local “string band” to play and the yachties and the village kids spent a very enjoyable evening dancing together. 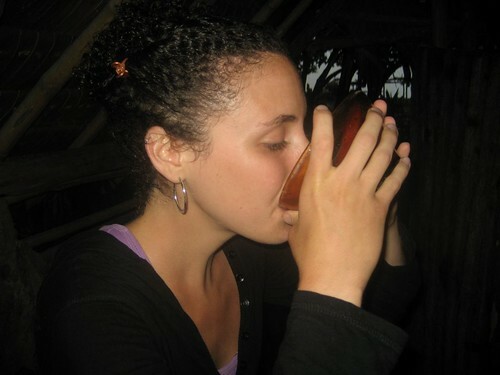 They offered kava to everyone as well but after trying a cup of the very potent brew the first night, most of us declined altogether on night two. Besides the village activities, Mark and I spent a lot of time snorkeling there. The water was about the clearest we have seen in Vanuatu and had some beautiful crevasses carved out in the rock by underground springs. The boat was sitting in about 60 feet of water and you could see to the bottom as if it were just a few feet deep. We decided to leave on Thursday evening as we have to start heading back to Port Villa – which is about 150 miles to the south – and we saw that the winds were right to make at least the first leg of the trip – as far as Epi – an island about halfway between Asanvari and Port Villa. We left at 5:00 p.m. – on an amazingly beautiful evening – and as we sailed away from the island of Maewo, where Asanvari is located, we could understand why some people consider it one of the most beautiful places in Vanuatu. We had a great sail, going past the island of Pentecost and then past Ambrym whose active volcano was clearly visible belching up lava during the night. Mark was on watch and said it was beautiful (I was down below trying to get some sleep). 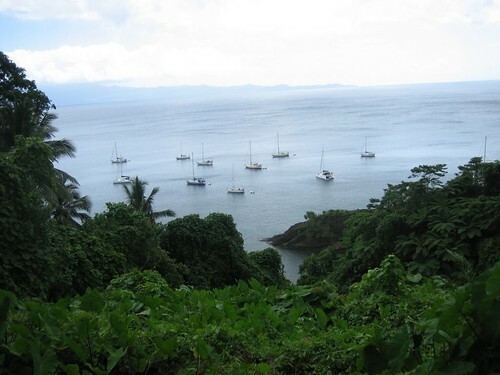 In the morning we sailed into our current bay – on the southern part of Epi. It is a black sand bay, but the water is crystal clear. We thought we would just stay one night, but now we are ending our second day here and will probably stay a third. It is quite lovely. Three guys from the village nearby paddled over today and asked to see our boat. We had them on-board and had an interesting time talking with them. Once again, we received fruit in exchange for clothing and other goods. We had a little train set on board which we gave them for their kids and they were thrilled. Our big activity today was changing our sails – we had to take down the large genoa and put up our much smaller blade jib. It is not a bad job, except once you take the sail down, you have to fold it up on the deck and put it away. It is so big and so bulky that it seems impossible to do. Leon and Ricky once helped us do this when we were together in the Caribbean, so they can understand how hard it is. Somehow we managed to do it however, having a good schvitz in the mid-day sun, and now have the correct sail for heading south. We have a small weather window for heading south so we are leaving here (Asanvari on Maewo Island) for either Epi Island (Revelieu Bay) or Port Vila on Efate. How far we go depends on wind and how we feel. We will depart in less than one hour (at about 5 pm local time, Aug 28) and head south along the west coast of Pentecost and Ambrym Islands. We are expecting east winds of about 15 knots. We ended up spending 4 nights in Surunda Bay. It is a pretty little bay whose main attraction for us was that it had free internet. We took great advantage of that, catching up on some work related stuff for Mark as well as enjoying seeing the NY Times and finding out what was happening in the world( after reading the news we decided it is better not to look). Our friends Mike and Lynn from “Wombat of Sydney” were at the same anchorage and we spent a couple of nice evenings with them. Mark and I met a pleasant 14 year old local boy named Gaston who was selling soft drinks from his family’s tiny store by the village of Surunda. (The sign outside advertised ice-cream, but we were not lucky enough to find any in stock). He took us on a little walking tour of the town, including a trip to his family’s garden, where he climbed trees to pick us vegies growing from tall vines as well as an assortment of fruits. At the edge of the garden were the remains of a plane from WWII. Surunda was a U.S. airbase during the war. 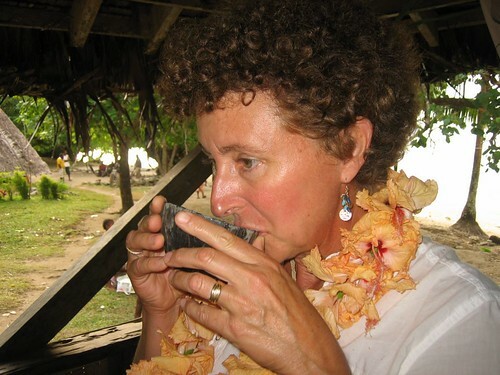 On Sunday, the 23rd, we decided it was time to go and with a pretty good weather forecast we headed out to our next destination – the island of Maewo – about 60 miles to the east. We had been waiting for the winds to switch around from the prevailing SE to the south so we could get a good angle for our sail. Friends had headed out on Saturday, and instead of finding south to southeasterly winds at 10-15 knots, they found winds coming much more from the southeast and blowing at up to 32 knots. 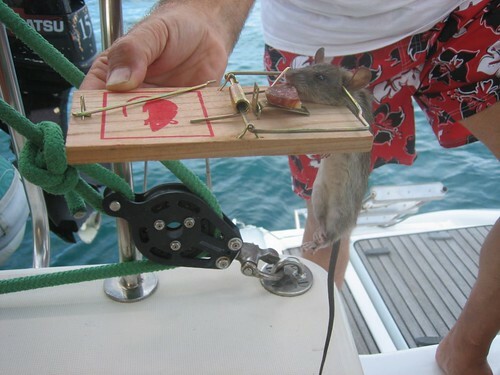 That makes for a very nasty sail. We ended up being quite lucky as we still had an upwind sail, but the winds were much lighter (about 10-12 knots) and we had a good enough angle to sail almost all the way. The tricky part about leaving Surunda was that the anchorage was inside a protective coral reef opening up to the east. The reef had an opening that was easily wide enough for a boat to pass through safely, but without good light you could not see exactly where the reef ended and the clear water started. There were also many coral bombies sticking their nasty little heads up here and there even in the opening. To leave Surunda and get to the next island before dark you had to leave very early , but the problem was that to leave the reef you had to sail east, directly into the rising sun which blinds you from seeing the reef. In addition, at high tide the reef is totally covered with water so you can not even see breakers on it, and there was a morning high tide for the few days around when we wanted to leave. We are very cautious with reefs (for apparent reasons), but could see no way to leave Surunda in the conditions we would optimally wait for in that situation: i.e. mid-tide, sun overhead or at our back, so the day before we planned to leave we went out in our dinghy with a portable GPS and mapped out exact locations through the pass that would be safe. We double-checked these marks against our RayMarine Chart Plotter and felt pretty secure about leaving through the pass. At 6:30 a.m. when there was enough light to see, but not too much glare in our eyes, we proceeded slowly out of the anchorage, and safely through the pass (bet you thought we were going to hit it). It was a bit hair-raising. We ended up having a terrific sail, and Mark even landed a small, but much desired yellow-fin tuna late in the afternoon. He also caught a mahi-mahi, but it ended up snapping itself right off the hook when Mark tried to pull him into the boat. Those guys are hard to catch. 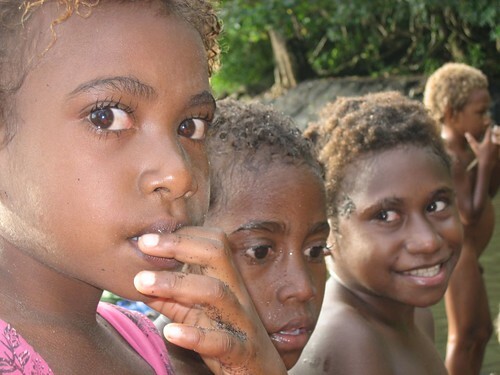 We decided to spend the night at the island of Ambae which we had to pass to get to Maewo. Ambae is a huge volcanic island that you can see from Surunda Bay, and is apparently the island that was the model for James Michener’s Bali Hai. Michener was based in Surunda Bay during the war. There were 13 boats in the anchorage just around the corner from us in Ambae- all part of a rally put on by the Island Cruising Association (ICA) that comes up from New Zealand every year – and they were all headed to the same anchorage we were going to on Maewo. We are actually members of that association, having joined a year ago so we could join them for a sail between Vanuatu and New Caledonia. We decided to get up really early so that we could get to the anchorage early and secure a good anchoring spot. It is the first time this year that we have been with so many boats. We left the anchorage at first light (about 5:45) and had a bouncy ride the 12 miles into the anchorage at Asanvari – strong wind on the nose, big seas. We were delighted to find three boats here already that we know and like very well – Intiaq (Swiss), Cardea (American) and Mondavi(Italian). There are 3 mooring balls in the anchorage here in Asanvari, put up last year by the ICA and because we got here so early we were able to secure one . Normally we like to anchor rather than tie up to a mooring ball, but the anchorage here is very deep and filled with coral on the bottom, so we were happy to get a mooring ball. There are now about 12 boats in the anchorage. 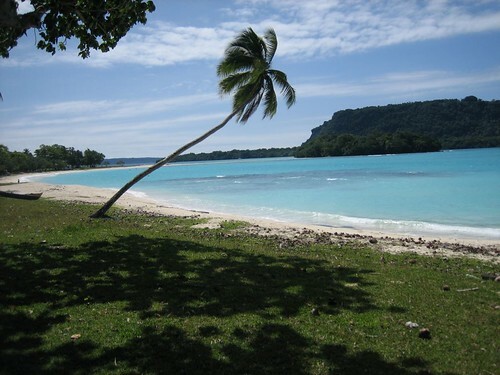 Many people consider it the most beautiful in Vanuatu. We can’t say that, but it is, indeed, beautiful, with very blue, clear water and a waterfall running down the steep cliffs and into a deep pool just behind us. Both Cardea and Mondavi were planning on leaving first thing in the morning, so we had a small party on our boat with them last night which ended up being a lot of fun. Lorenzo (Italian) and Candia (German), the couple on Mondavi, are extremely outgoing and talkative and very funny and between them and Jim on Cardea we had a wonderful time. I made pizzas and everyone drank wine and told hysterical sailing stories. All of the bad and strange things that happen when sailing end up being terrific stories, especially when told by other sailers, whom, we have learned, all have a tendency to exaggerate! We are now in the Surunda anchorage at the southern end of Peterson Bay on Espritu Santo. 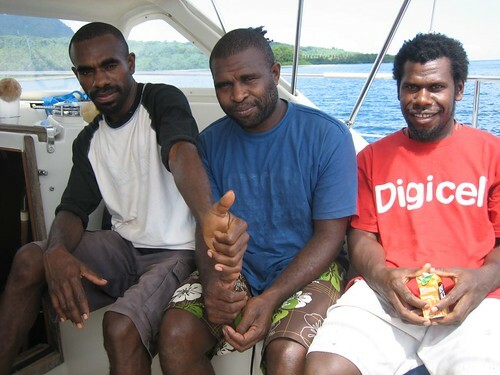 We came here because it is fairly close to Luganville and we had to go to Luganville to get a visa extension and renew our “cruising permit.” That has been successfully accomplished. 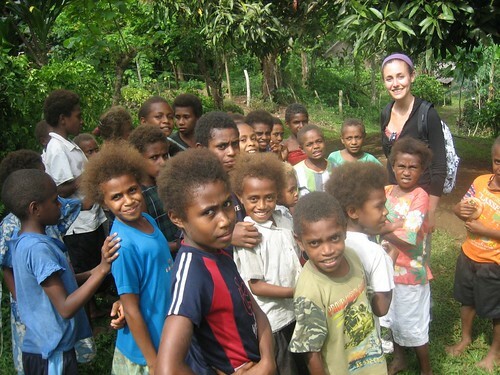 We have some internet access here and so use this opportunity to post a selection of photos taken at Port Orly on Espritu Santo Island and at Gaua (Santa Maria) Island and Vanua Lava Island in the Banks group of islands. You can anchor safely in a large sandy area between Bucephale Island and Thion Island. There are numerous coral bombies, but most are low and it is easy to find a spot to anchor. The water is aquamarine, warm and fantastic for swimming. If you take the dinghy all the way across the bay to the west you will find that it leads into a river which is easily navigable by dinghy. You can also kayak once you get inside the river. Up the river about 1/2 a mile is an adorable restaurant, just being completed while we were here. 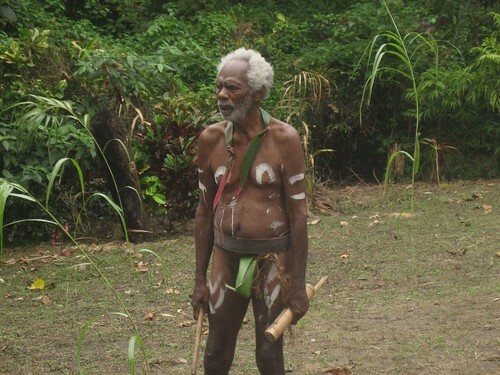 If the two toothless Vanuatu grandfathers who are building it are able to pull it off, it will be a really fun destination for any future visits. The anchorage faces Thion Island which has a beautiful little beach that is walkable at all tides – some great shells wash up there. 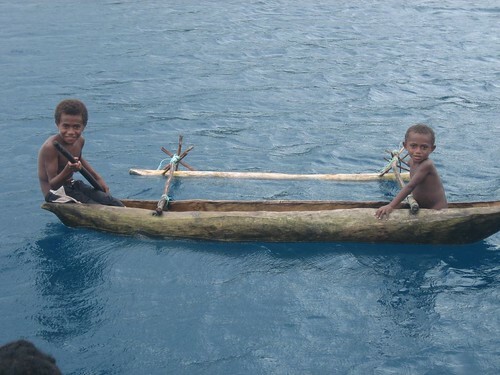 The locals sometimes fish nearby, but do not venture close to the boat. The village of Port Orly has one restaurant in operation, owned and run by Rosina – worth a stop, even if it does cost about $9 a person (a fortune here). No menu, they just serve you what they have that day. The villagers seemed unfriendly at first, but after walking through town a few times we discovered that they are actually very sweet and friendly, especially the kids. A small amount of conversation in French earns many smiles. Behind the school is a little cantine where you can buy local fruit and vegetables during school hours. They will even try to get you things you ask for if you order it the day before. There are a few tiny stores – they just have some old tinned food and fly covered bread snacks. 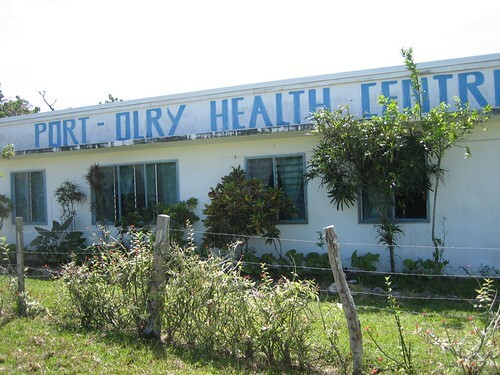 There is a local health clinic which was very greatful to take all of our old medications – their supplies are almost nil and one woman does everything by herself. The sandbar near town is great for anchoring the dinghy, but only at high tide. At low tide it is totally inaccessible, being filled with broken hunks of coral. The alternative to the sandbar is a nice sandy beach about 1/2 a mile away by dinghy – towards the west – right next to a broken down jetty. 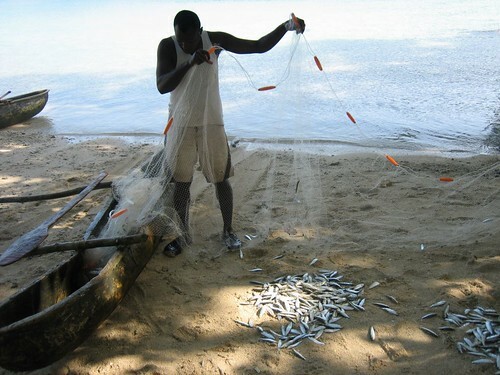 The fishermen who hang out there will be happy to share their fresh sardines with you. Getting back to the boat from the jetty can be a bear – a chop tend to form in the open water between town and the anchorage. You have time your visits to town carefully. Very nice place……. pretty close to paradise in fact. Tomorrow, however, we have to move on…. heading a little south. 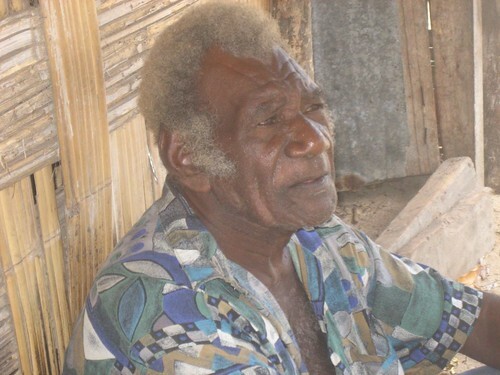 In our last blog we wrote that Chief Nixon of Waterfall Bay had sung us a welcome song and a farewell song that he composed just for us. We thought that the farewell song was premature, but it turns out it was not. The weather turned nasty and the next day (Aug 12) we left just at sunset. Heavy rain and squalls ended at about 3 pm and the weather forecast was good for going but not staying, so we left. We had a better than expected sail south and arrived in Port Orly early in the morning. The hot and rainy weather that we have been experiencing for the past two weeks has been replaced with strong southeasterly tradewinds and lots of sunshine. It has cooled off and the humidity has plummeted. I am wearing a light sweatshirt as I write this, and we have light blankets at night. The chop in the bay from the winds makes the snorkelling less good. Instead, we have explored the town of Port Orly, hiked a bit, and canoed up the river at the far end of the bay. 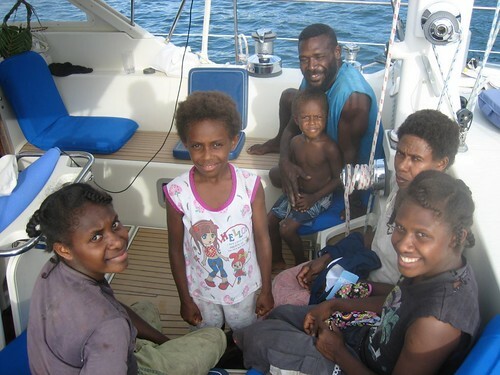 The Australian catamaran Ka Pai that we met in Tanna last year came in for a day and we had a pleasant BBQ on their boat. We will likely remain here only a day or two more before making our way further south. Waterfall Bay in Vanua Lava Island turns out to be the furthest that we will get this season. The remaining passages of the year all get us closer Australia. 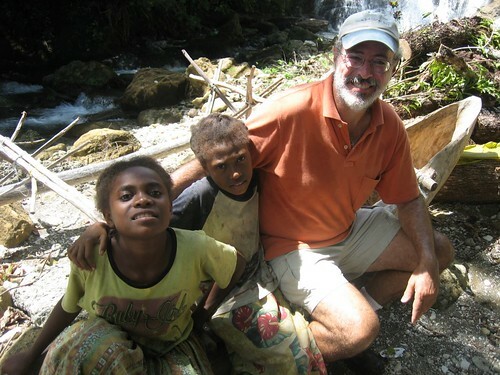 We are now in our 4th day at Waterfall Bay on the island of Vanua Lava in the Banks Islands of Vanuatu. As you may guess there is a big waterfall in this bay. It is only about 40 feet high, but it is wide and the water absolutely thunders over the top into a big pool before running into the sea. It is not the kind of waterfall that you can stand under – like those you see in French Polynesia. This would would probably crush you if you dared stand right under it. We aren’t about to try. It is pretty spectacular to see though. Waterfall Bay is beautiful and we have been lucky enough to have a few days of brilliant sunshine (not too common up here). We have also befriended Chief Nixon – one of several chiefs in this very low density place. It is actually hard to meet a grown man here who is not a chief or at least a chief’s brother. Chief Nixon is quite an engaging personality and has a lovely family of three small children. 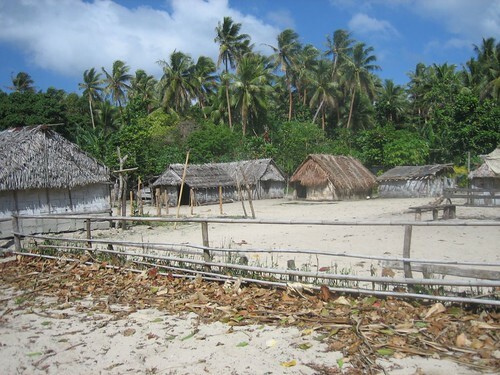 Their home (a large and clean thatched hut) is on an otherwise deserted stretch of beach that is backed by a steep, richly foliated cliff wall. We have enjoyed exchanging gifts for fruit with him and his family. They have brought us large loads of bananas, papayas, yams and drinking coconuts and we have given them childrens books, crayons and large bags of clothing (mostly for the children). They are extremely appreciative of the gifts we have given (which is not always the case). It is fun for us as we still have a lot of stuff on board to give away and it is nice to have a family that we want to give it to. 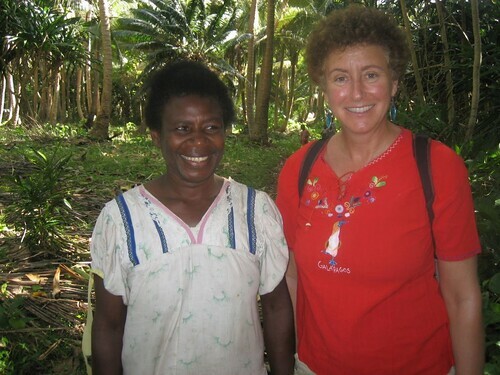 It is often dificult to really have a conversation with the locals as our worlds are so very different – with no newspapers, magazines, stores, electricity, running water or other modern conveniences – they are extremely isolated. Chief Nixon, however, is a very intelligent guy and we have really enjoyed getting to know him a little. 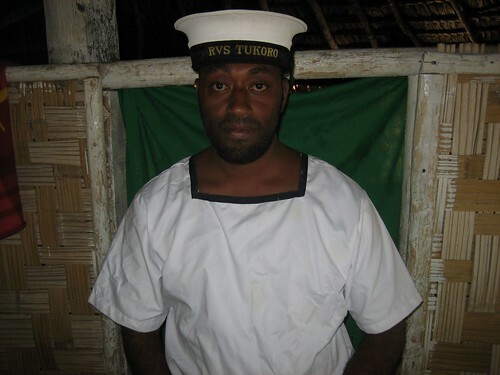 Many of the other islands of Vanuatu have a supply ship that comes once a month with rice, sugar, oil and other supplies, but they only get a ship once or maybe twice a year. Fortunately the sea is full of fish and lobster here and people do not go hungry with all the fruit and yams that they grow. They even have beautiful fresh spring water flowing out of the rocks near the seashore. One of the boats that was here the last few days with us is also a friend from previous sailing years and they are the only boat we have met that is not a sailboat. Their powerboat is called Special Blend (he sells fertilizer!) 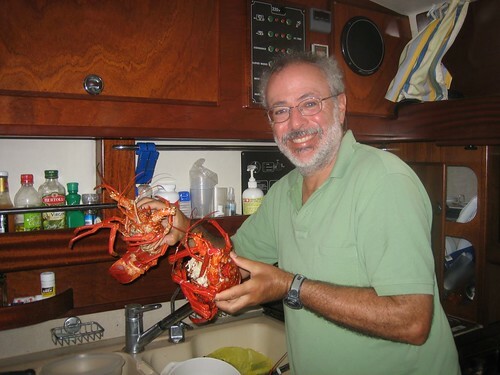 and Jim, the owner, and his wife Martha are avid fishermen. Jim caught a couple of huge fish as he sailed in here and presented them to Chief Kerely – who is now his friend for life. Rivalry between the chiefs is a bit of a problem here. When yet another chief (Chief Jimmy) heard about the big fish that Chief Kerely got, he rowed over to Special Blend and asked for a fish too. Jim is a really good guy and actually pulled up his anchor and went out of the bay and started trolling the reef outside for a few hours until he could bring in a suitable fish for chief #2. Several boats have come and come since we arrived here 4 days ago, but right now the bay is empty except for us. Very cool. 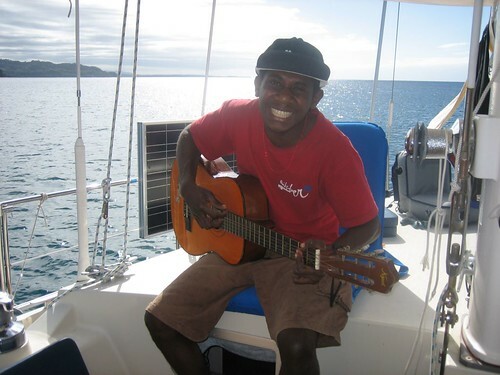 Chief Nixon just paddled over to our boat with his old guitar and sang us two songs that he just composed for us. There was a welcome song and a farewell song for Mark and “Flora”. It was so cool – we have it on video and want to post it to the blog when we eventually get somewhere with internet. PS That is Mark and his wahoo in the photo,assuming the photos makes it to the blog. 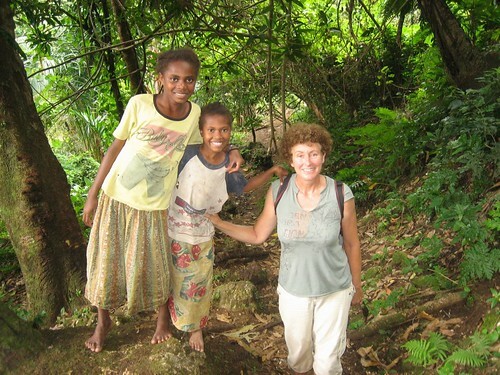 We arrived in Waterfall Bay, Vanua Lava Island in the Banks Islands today. We stayed an extra day in Gaua Island as the weather was atrocious yesterday. The problem with all of the Banks Islands is the lack of even a single protected anchorage. We anchor in just a little dent on the west side of an island. When strong squalls came up yesterday morning at around 4 am, the seas built and Sabbatical III was just pitching around in an uncomfortable manner. The forecast is pretty good as far as seas state goes for the next few days, so we are hoping for more comfortable anchoring. 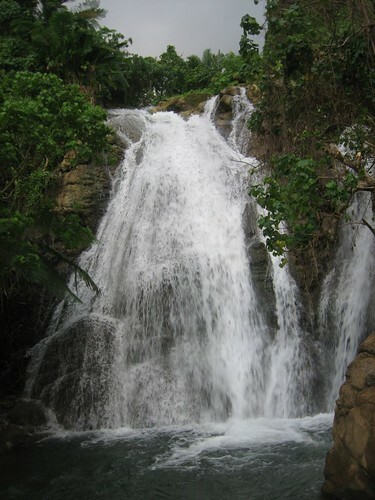 Waterfall Bay has two large waterfalls cascading down to the sea, and a small village perched below steep cliffs. Our arrival here brought together the same set of boats we were with in Port Orly waiting for a weather window to head north – Flame (Australia), Kaiterete (New Zealand), Miami (Switzerland), and Sapho (Germany). We have not been to shore yet but have already made an arrangement to get lobsters tomorrow morning. We will likely spend a few days here before heading to Reef Island to the northwest. We are in Lakona Bay (Ptetewut), Gaua (Santa Maria)Island, in the Banks Islands. We had a better than expected sail here yesterday. Right after we cleared the bay at Port Orly in Espritu Santo Island we turned off the motor and sailed all the way to Gaua Island in 10-12 knots from the ENE. My experience fishing this season has been mediocre — a few smallish fish. I had not been able to land a big fish capable of feeding us for several meals until yesterday. Just as we were clearing out of Port Orly, passing to the south of Lathi Island, something big struck my lure before we had even set the sails. It was a big, toothy wahoo about 4 1/2 feet long. Wahoo are voracious predators that swim at up to 50 knots and have a mouth full of sharp teeth. Fortunately, I had 2 meters of stainless steel wire leader connecting the fishing line (210 pound test) to the lure or it would have bit right through. 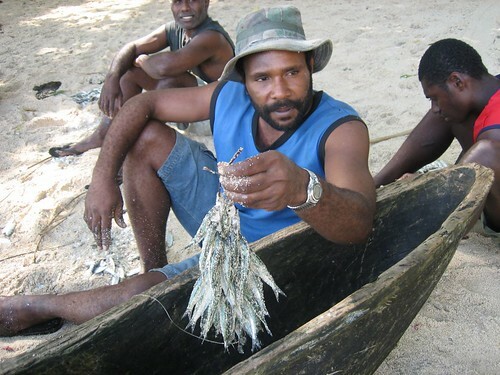 There is very little waste in this fish — its pretty much all edible white meat. He yielded about 24 steaks of 3/4 to one pound in weight each. Today we toured two village in the bay and traded for fruit. 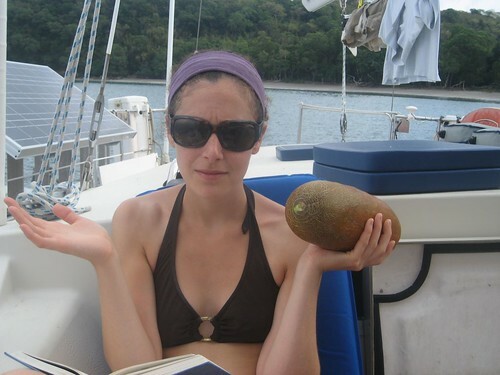 While on the boat, people are always paddling up to Sabbatical III asking for something or offering to trade. We gave away a lot of stuff but it got tiring after a while. The women of this bay have a unique form of musical expression called “watermusic”. Eight or ten of them wade out into the river and make music by vigorously slapping the water in different ways to achieve a surprising range of tones. Laura and I are the only visitors in the bay, so we were the only “paying” customers, although all the village children came out to watch. 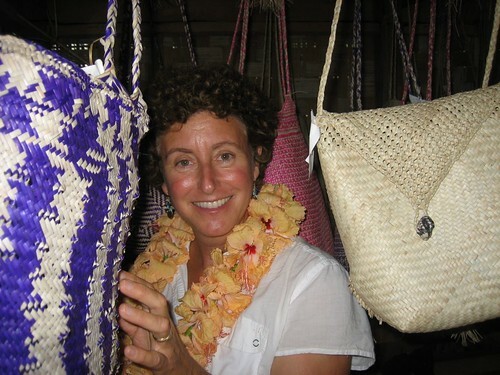 Tomorrow we are heading north to Waterfall Bay in Vanua Lava Island, about 35 miles away. We have been in Port Orly on the island of Espritu Santo for one week now. Today was the first day it did not rain in the past five days. On some days it rained 18 or 20 hours and came down hard. We have hung out here waiting for some wind to come up and the rain to slacken. Tomorrow seems to be the day. There is not much wind forecast, only 10 knots, but that beats the forecast of 2-5 knots for the rest of the week. 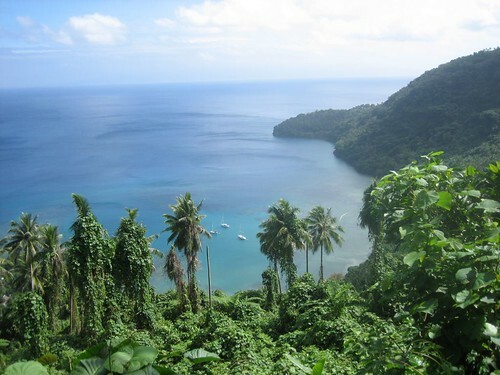 We will leave before 6:30 am and head for Pwetevut Bay on the southeast corner of Gaua (Santa Maria) Island. It is about 50nm from here and should take us 8 or 9 hours in light winds. 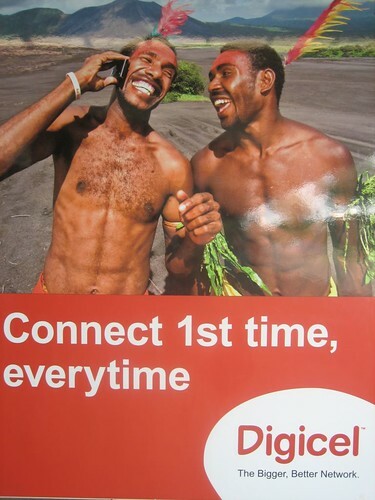 There is no cell phone service in the Banks Islands — indeed, very little communication at all. Supply ships come come and only a handful of yachts visit each year. We will,of course, still have satellite email. We are looking forward to some adventures. Paradise. I think I’ve finally found it. I’m sitting in the main salon, swaying in the gentle roll of a small, shallow bay, fringed by a white sand beach where the local fishermen keep their wooden outrigger canoes. The sun just set pink and purple over the palm and banyan trees that cover the low-lying island. How did I get here? Just a week ago, I was in Evanston, IL, running through the torrential rain that punctuated the end of my graduation ceremony from Northwestern; then I drove across country with my friend Hannah to NY where I embarked on a marathon of flights: from NY to LA, from LA to Brisbane, Australia, and then from Brisbane to Port Villa, Vanuatu, where Mom and Dad were waiting at the airport. We spent the first two days in Port Villa, the bustling urban capital of this island nation, population 210,000. 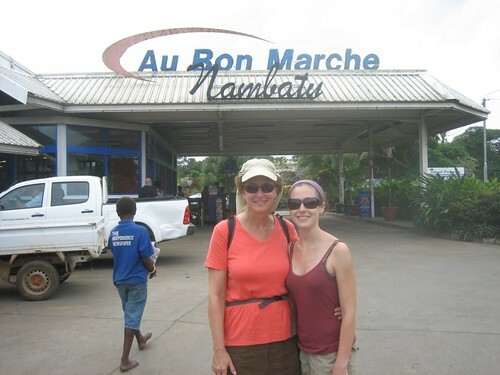 We stocked up on food at the “Nambatu” grocery store (just say it phonetically and you’ll get the meaning) and the open-air market, walking around (and shvitzing our heads off), and sleeping what seemed to me to be absurdly long hours (although to cruisers, 11 hours is standard). 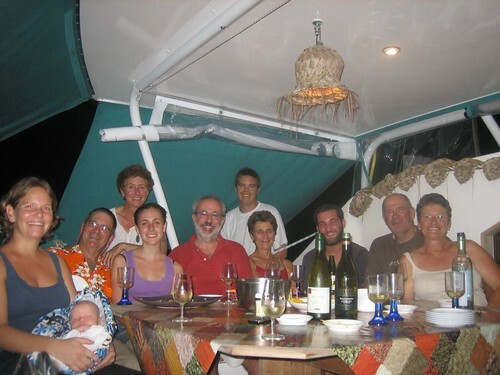 On the second night we had “sundowners” with the couples of three other boats. We drank wine and toasted to our various accomplishments, including my graduation, two recent wedding anniversaries, and the successful capture of a wily rat that had been eluding our good friends on Intiaq (he had just sunk his teeth into a nice piece of salame when the trap sprung and, well, that was that). Yesterday we did a mini-sail over to another bay for an afternoon snorkel, before heading out for an overnight cruise to Malekula and Tomman Islands. Although I planned to be a good crew member and stay up as long as I could, a combination of jet-lag, fresh air, and an anti sea sickness pill made it physically impossible for me to keep my eyes open. I did manage to get myself on-deck for Mom’s 1:30-6:00 AM shift, and I watched the stars and then the sunrise through intermittent naps. r house. An elder man showed us inside the prayer house, and donned the ceremonial church sacraments, including a wooden crown, spear and sword (we aren’t sure this is exactly how the Seventh Day’s do it in the US). We walked along a beautiful path between the villages, swept clean and lined with manicured bushes and flowers. It was as if we were in a tropical garden. Along the way, the girls and a growing party of children and relatives pointed out the island’s bounty: lemon, guava, grapefruit, pamelo, banana, pineapple, papaya, mango (not in season!!!! 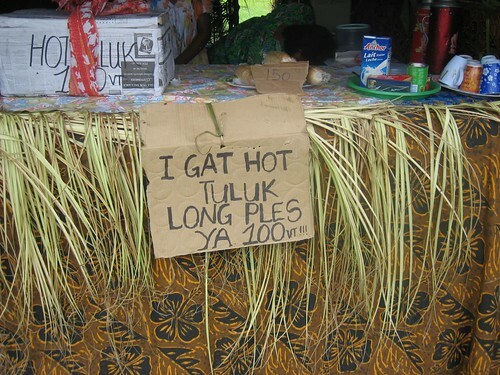 ), all kinds of tubers, cocoa nuts, coconuts, green vegetables, fresh chicken eggs—they offered and we gladly accepted. 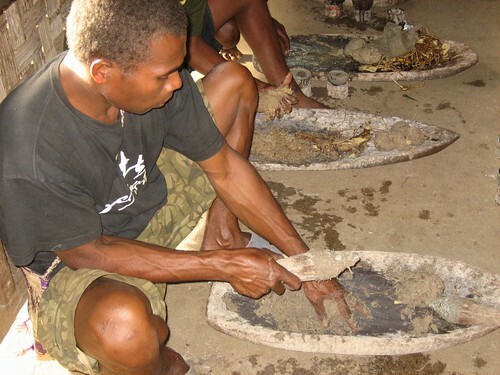 We finally arrived back at the beach where a group of men were preparing kava, a special intoxicating drink enjoyed by the men in Vanuatu. 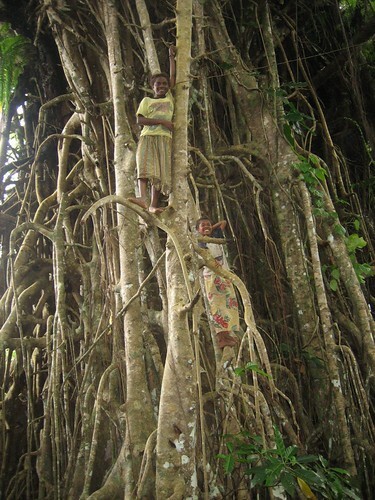 In fact, Malekula is known for its particularly potent variety. 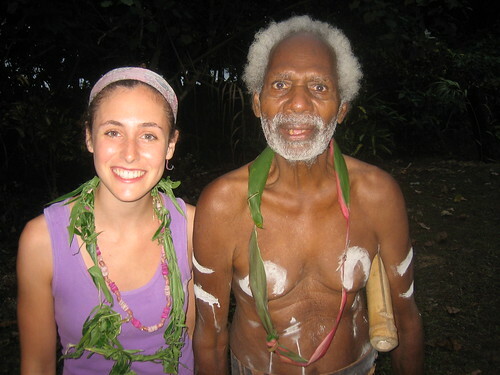 Dad was invited by the chief for a kava session tomorrow afternoon—“chief and chief” he said, smiling. A beautiful sunset kayak ride with Mom rounded out this ridiculously amazing day, and now its time to get my 11 hours. 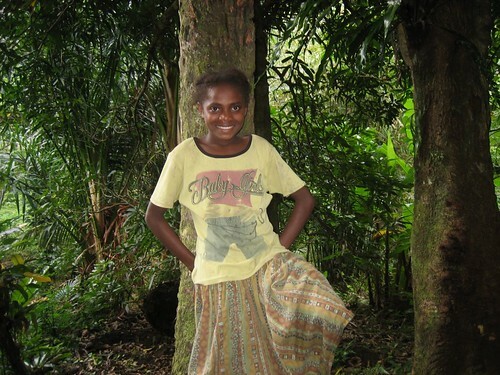 It is Tuesday evening, June 23, and we just returned to Port Vila to be sure we were here and ready for Hannah’s arrival on Saturday. The 3 day Government festival in Mele did, indeed, turn out to be a 3 day festival – going on non-stop all night and all day. It did not make for a peaceful setting for the boat with all the amplified music coming from shore throughout the night, but we were kind of stuck there because of the weather. The winds picked up on Friday and Saturday and it rained and blew hard. No matter how hard it rained, or how the wind howled, the party onshore just kept on going – much to my chagrin. We were guessing there must have been a lot of pretty drunk or kava-ed out government officials out there by the third day. When we finally left on Saturday morning the weather had improved quite a bit and we were able to sail up to Havannah Harbor – about 25 miles away. It is a fairly difficult sail as you have to go around a point of land known to local sailors as “Devils Point”. It is a well deserved name as the wind just pours over the hills there and kicks up turbulent seas and big waves. The wind was gusting up to 35 knots and we had to reef in our sails. Just after we rounded the final nasty portion of water and were heading into the smooth and protected waters of Havannah Harbor, we heard a loud “ka-ching” and saw that we had ripped the genoa (the front sail). There is a large metal ring sewn into the clew of the sail and reinforced by hundreds of stitches that holds the jib sheet. It must have weakened without us knowing it, and the strong gusts must have helped the stitches just rip apart, so the entire metal ring ripped right out of the sail. Unfortunately, while this left the sail itself in pretty decent shape, it was unusable since there was now no place to tie the sheet and thereby harness the sail. We rolled it up and just sailed with the mainsail into the bay. 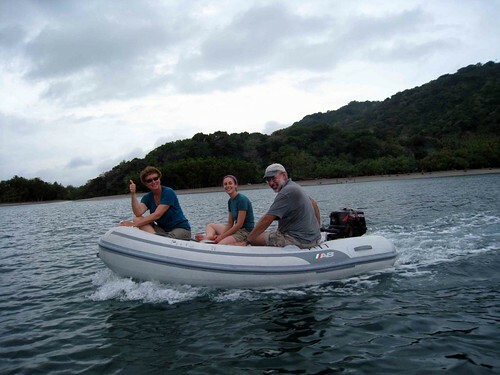 There are several anchorages in Havannah Harbor and we selected one about 2/3 of the way inside the bay (maybe 5 miles from the mouth of the bay) to be sure we were in a calm place and also because we knew two other boats there. Even though it was still quite windy, it was well protected from swells and after anchoring the boat it was just as peaceful and calm and quiet as possible. 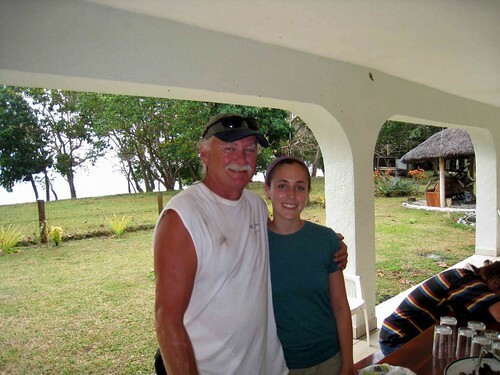 The two boats that were there – Betsy and Nat from “Bahati” with their 19 year old crew member Cameron and Jim from “Cardea” – have been friends of ours for some time now and we spent a couple of days there together – taking turns at having pot-luck dinners on our boats. The weather finally cleared and we were even able to do some swimming and snorkeling. There is a cute little town nearby with a brand new road being built through it. The road is sponsered by the U.S. and all the locals were very happy to tell us about it. There are only a few houses, and a school along the road right now – no stores – but maybe things will change once the road is completed (too bad). 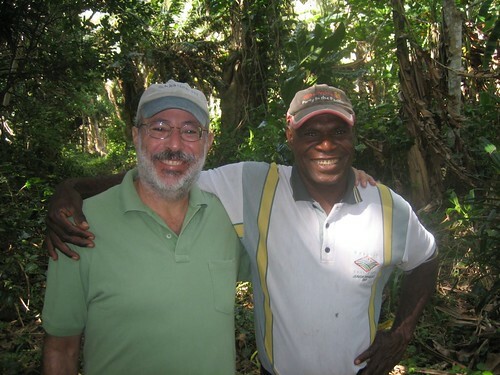 It is going to be a nicely paved road and will eventually go around most of Efate island. 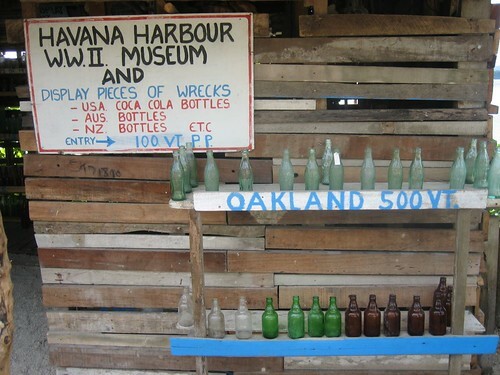 There was one very interesting little museum on the road – the “Havannah Harbor WWII Museum”. It is just a 10 by 20 foot shack filled with coca cola bottles, beer bottles and some old wreckage from WWII. There is even a wing of an old Corsair fighter plane propped outside the door. 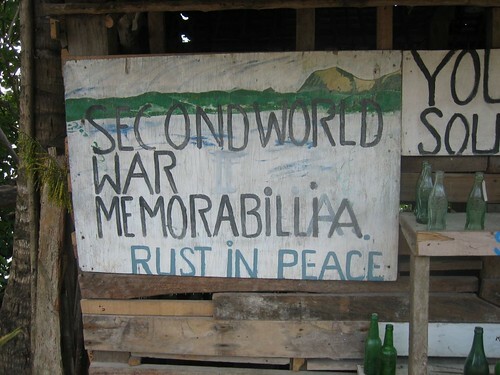 The museum is owned and run by a very friendly Vanuatan man, Ernest, who has been collecting and displaying his stuff for the past 34 years. 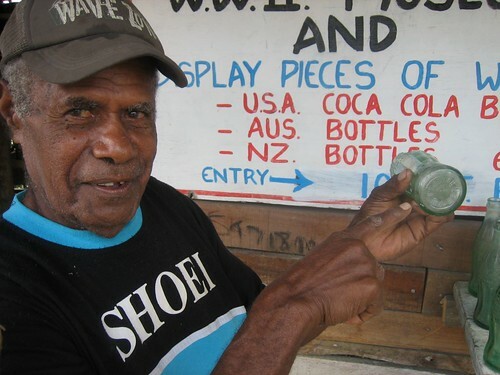 He has coca cola bottles from over 350 different U.S. cities – all dated before 1945. 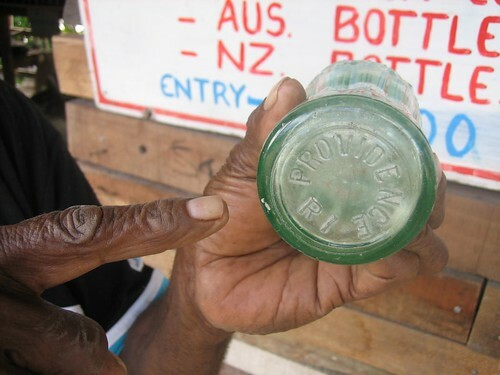 Each one has the name of the city it came from and the year it was manufactured right in the glass on the bottom of the bottle. He managed to pull one out for us from Providence, RI when we told him where we are from. Everything in the museum was left behind by the U.S. navy which used Havannah Harbor as a staging point for the war in the Pacific. There were more than 80 naval vessels in the bay here during the war – starting in 1942 – and it was the major staging point for attacks in the Solomon Islands (Guadalcanal) and New Guinea – both of which are nearby. To get back to Port Vila (and points beyond), we had to have a jenoa sail up, so Mark and I put up the new large genoa that we had built for us in New Zealand last year. Thank goodness for that! Our sail back to Port Vila was even harder than the sail to Havannah Harbor, with winds and seas at and around Devil’s Point leaping all over the place. A very uncomfortable ride. Luckily the whole sail back here from Havannah Harbor was only 6 hours – with the two hours before Devil’s Point being calm and pleasant. We were glad to reach Port Vila and tie up to a mooring ball in such a nicely protected, calm place once again. Tomorrow we will try to get the ripped genoa fixed. We left Port Vila on Monday and sailed just a few miles away to Mele Bay – it is a quiet little anchorage outside the village of Mele which is the 2nd largest village in Vanuatu with 6,000 inhabitants. 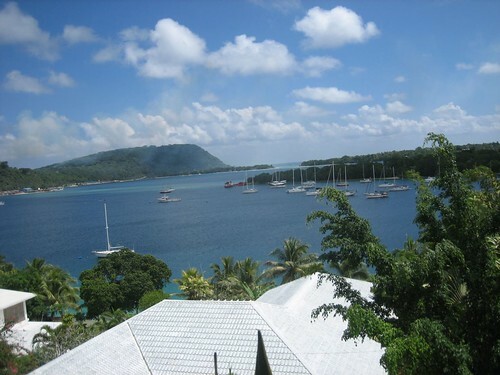 Because it is only 10 minutes by car (and one hour by sailboat)from Port Vila, it is quite modern, and although poor by western standards, quite wealthy for Vanuatu. It is clear that most houses have t.v. and everyone has a cell phone. 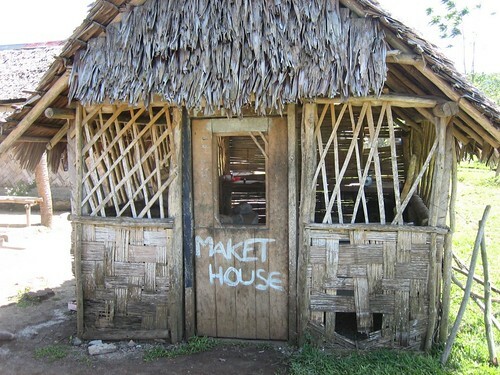 Lots of simple thatched houses, but also lots made from tin, or even whitewashed with real windows. Lots of people hang yams outside on lines and at first we thought they were rows of sausages. This might make sense as besides yams, the other popular household item is pigs – lots of them – and really huge ones as well as many piglets. Mark and I walked around the village when we arrived and it was clear that we were in a neighborhood that is very used to tourists. No one gave us a second glance. It has been nice getting out of Port Vila. The water here is very clean and we have been able to swim every day the last 3 days and take walks on the long beach. It has not exactly been a quiet anchorage though. The province of “Shefa” which we are in is apparently celebrating 15 years of being in existence and there has been nearly non-stop music and festivities being held at the large soccer field which is quite close to the anchorage. Last night the music and amplified prayers started at 7 p.m. and seemed to go on almost without stop until this morning at 7:00. We walked over to the field today to see what was going on and it looks like this government holiday is going to continue for a full three days! 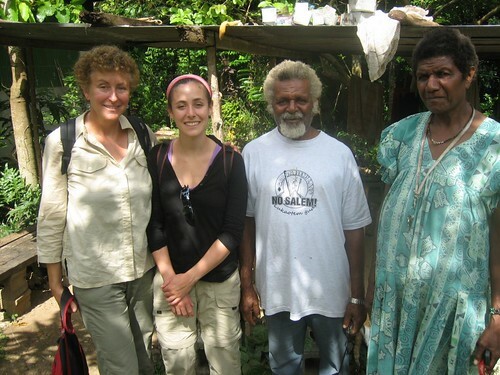 It was fun to be there – lots of dignitaries (including the president of Vanuatu! 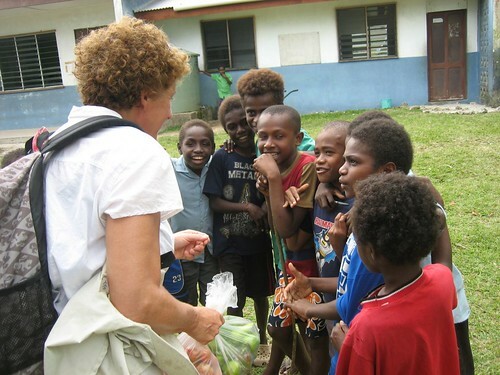 ), rugby tournaments, comedians (who we could not understand), games for the kids, Vanuatu string band and reggae competitions, and best of all -food booths. It was nice to hang around and watch everything. For the last 3 nights there have been 5 or 6 boats with us in the bay – all of them from New Zealand. 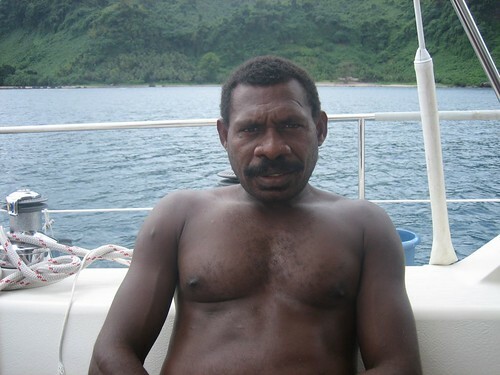 One night everyone got invited to “Midnight Sun” – a boat built by an Australian man, but sailed out of New Zealand. When he built the boat it was a 40 footer, but after twenty years of sailing he decided it was not big enough and decided to just add 10 more feet at the back. It made for an excellent party boat with more deck space than any other boat we have been on. Today all the boats left and we are tring to decide whether to stay here a few more days,head north to another anchorage, or head back to Vila to get good internet access (always important). The weather is pretty terrible – lots of clouds and some rain. It is really beautiful when the sun comes out, but that has not happened more than a few hours every day. Happy 31st anniversary today to us! customs and immigration. It felt great to walk on dry land and we took care of some necessities – like getting money, a sim for our cell phone , eating lunch out (a thrill at this stage) and finally, for a highlight of the day, stopping at the huge vegetable and fruit market and stocking up on some oranges, bananas and sweet, huge, pamplemousse. We finally feel like the trip is starting. It has certainly been a big setup time – 3 weeks of preparation in Australia, 1 week at sea, and 1 week on land before we are back to our new “normal” life. L.
We arrived safely in Port Vila about 8 hours ago (11 am this morning). The winds were good, the seas were calm, and there was a full moon in a clear sky. All in all, an excellent sail north. Tomorrow we will get formally checked-in and move over to a mooring. There seems to be good wireless in the mooring field now, so perhaps we will get ourselves an account and be able to use Skype and check our email accounts. More tomorrow. us to the east of Tanna and to the west of Erromanggo Islands. We have heard from several very good friends of ours and all of them are coincidentally in Tanna right now, the next island up the chain. 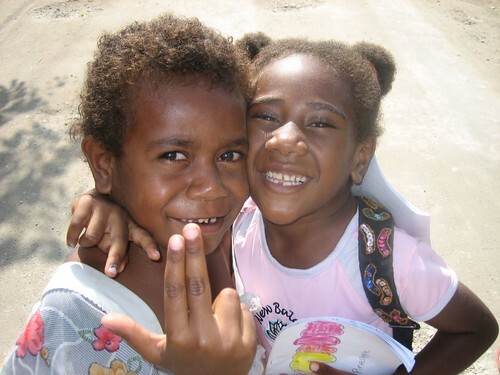 We will all meet up in Port Vila next week and there will be lots of i socializing. How fun. The island here looks lovely and is supposed to have excellent snorkeling with a huge protected reef – but it is very windy and quite cool so I don’t think it likely that we will get in the water. 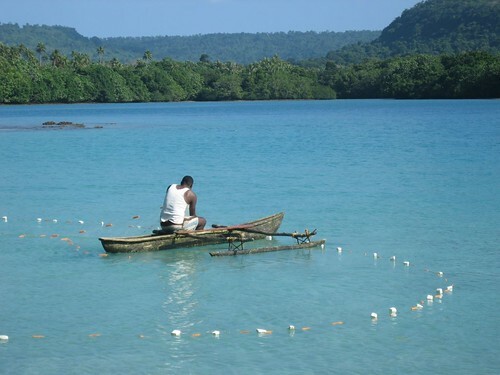 Aneityum is cool because it is the southernmost island in Vanuatu. In the winter the temperature ranges from 60 degrees to 74 degrees. 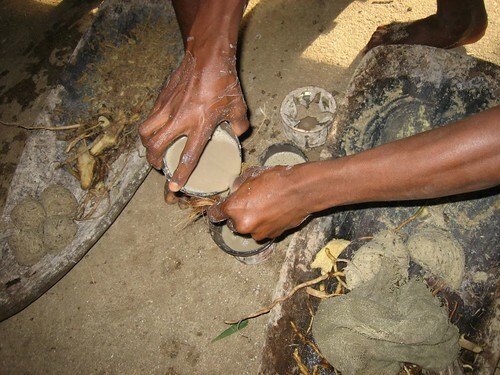 There are no ‘kustom’ (traditional) villages or ceremonies anymore. The missionary who came here 150 years ago converted almost everyone to Christianity within a few years, although it is said he could not easily stop the custom of strangling wives on the husbands’ death. Women apparently insisted on this right. We expect that this has changed by now. E 169 degrees 46.6 minutes. The wind came up up three days ago. It was later than forecast, but to make up it’s tardiness, it blew harder than forecast. We had 25 knots for much of the time and seas rose to 12 to 15 feet. We sped along but it was not very comfortable. 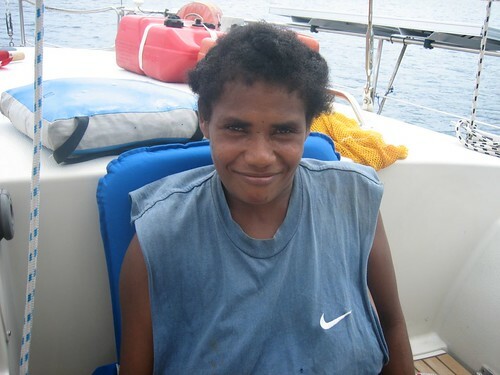 Our friends on Priscilla, who left Australia three days after us, decided to return to Australia after two days out. They did not have as good an angle to wind as we did, so they probably did the right thing. We had the wind aft of the beam the whole time it blew since we had done so much “easting” in the previous days. It was squally when we approached Aneityum but the entrance to the bay was not difficult. There is one other sailboat here. The wind is still blowing hard and it is raining on the slopes but it is well protected in this bay. We have already had a visitor aboard. 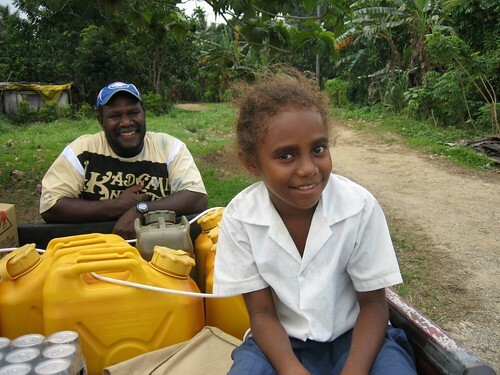 Joseph, a teacher in the secondary school, paddled over in his outrigger. He will help us to arrange a formal check-in sometime during the next few days. There is a barge/dredge and tugboat that just came up from New Caledonia, and a Customs/Quuaratine/Immigration crew will fly out from Port Vila to check them in, and we hope us as well. For now, all we want is to catch up with sleep and clean up all the sailing gear strewn around the boat. Laura, in particular, is happy not to be out in the rough sea for another night. She says she has reached he limit.